Today, we did not do work with amiRNA and focused our efforts on hpRNA. 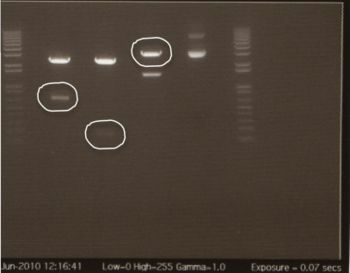 We obtained undigested V0120 with a death gene insert from Team Flavor, and we have inserts from previous PCR reactions that all need to be digested and ligated into V0120. colony inoculated overnight and medium was centrifuged to obtain a pellet. A few colonies were found on the pENTCUP2 + Backbone plate, NosT + stop and backbone plate, and b15 backbone control plate. Colonies were picked from the plates and placed in 3ml of LB and agarose in a culture tube. The tubes were placed in the 37°C shaker for 8 hours. 2 mL of LB+AMP was added to the cultures, bring the total volume to 5 mL of LB+AMP. Cultures were left to shake overnight. Placed in 37°C waterbath for 20 minutes.